I'm often being asked advice on how best to prepare food for a large crowd. You don't want to end up slavishly cooking in the kitchen while your guests mingle, so make sure to choose easy-to-make party foods. Turbot is a flat, white-fleshed, delicately flavored fish. 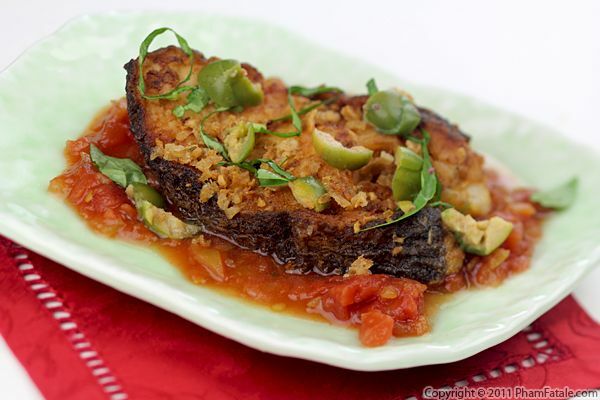 To avoid overpowering the mild fish, I breaded and pan-fried it to create a crispy outer layer, and then placed the fish on a bed of simple tomato sauce. 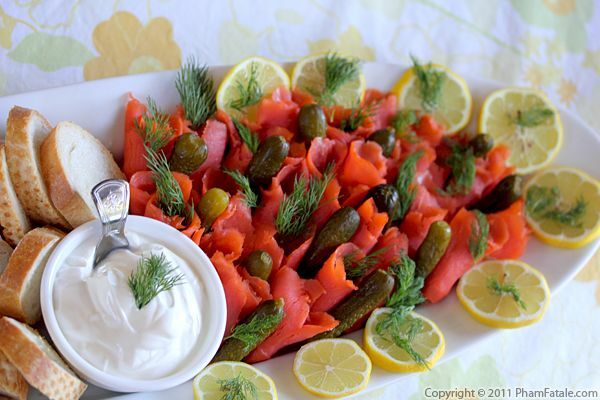 I garnished the top with Castelvetrano green olives, which added a mild, lightly salted, briny taste. The fish was both flaky and meaty in texture and full of flavor. Chả cá thăng long is a pan-fried dill fish dish. Try saying that three times in a row! The yellow hue comes from aromatic turmeric powder. Unlike Indian and Middle-Eastern cooking, dill -called thì là in Vietnamese- is not a very common ingredient in Southern Vietnamese cooking save for a few seafood dishes. Dill has a unique fresh flavor; it's sautéed in the same pan where the fish was pan-fried, then mixed back with the turmeric fish. The moisture from the herbs keeps the fish from drying out. My family is originally from Cầnthõ and Sàigòn (Southern Vietnam) but my mother took me to Hànội (Norththern Vietnam) when I was seventeen. This dill fish recipe originates from that region. That's why it's also known as chả cá Hànội. You also might find it as chả cá lã vọng on some Vietnamese restaurant menus. 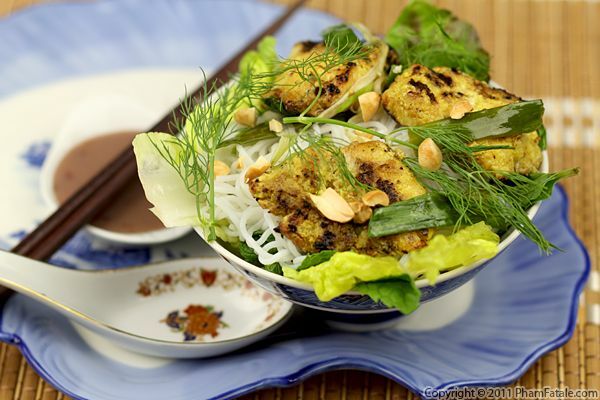 If you're looking for a healthy dish, a meal composed of fish and cold rice vermicelli noodles (called bún in Vietnamese), might be the perfect fix. Fish, in general, is an excellent light meal idea. 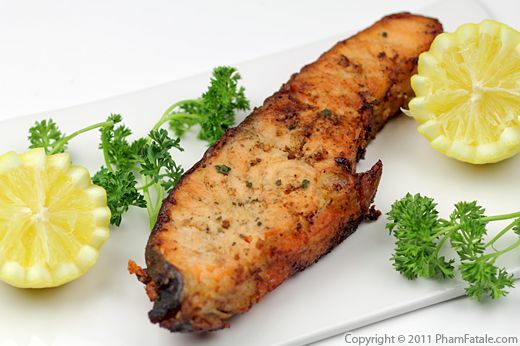 Salmon in particular, if prepared properly, can be very moist and flavorful. First, make sure to ask your fishmonger to clean the fish and its skin. The next important issue is the marinade. Finally, don't overcook the filet and a delicious dinner will be in your future. For this recipe I used lemons as a tenderizer and flavoring. I pan-fried and created a crust around the salmon steak and finish baking it in the oven on a bed of lemon slices. I served it with pineapple salsa (mango salsa would work too). I love fish, but halibut can be a little bland. Like other mild ingredients though, it makes a perfect canvas upon which to "paint" stronger flavors. 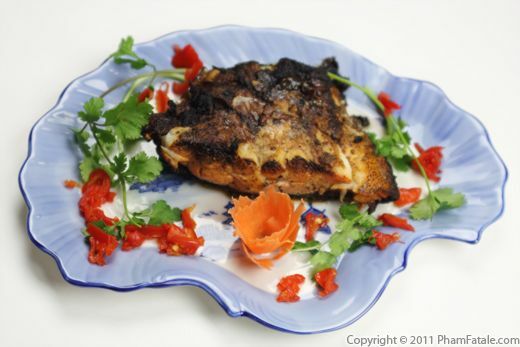 For this recipe, I used a spicy and tangy yogurt marinade to perk up the halibut. In this case the marinade does double duty, as it not only flavors but imparts a lovely color to the fish. The preparation of the halibut is similar to how I cook many other fish so they're covered in a thick, paste-like marinade. A brief pan sear followed by a short stint in the oven is all it takes to transform the uncooked halibut into a main course you'll be proud to serve. Page 6 of 13 pages.